Description: 1956 Brooklyn Dodgers Funeral Mass Card Courtesy of N.Y. Yankees (VG) Today this card would certainly be called a strike against political correctness, but in 1956 was intended as a humorous novelty issued -Courtesy of N.Y. Yankees.+ This is an actual funeral Mass card issued -In Loving Memory Of The Brooklyn Dodger Bums,+ upon their passing, -Died October 10, 1956,+ when they were defeated in the 1956 World Series at the hands of the New York Yankees. The last game of the 7 game series was played on October 10 at Ebbets Field with the reigning World Champion Dodgers losing the Series upon their Game 7 loss by a score of 10 to 3. This was the fourth time in five years that the Brooklyn Dodgers and New York Yankees faced one another in the coveted World Series. On their way to delivering the Dodgers to their -grave+ the Yankees and Don Larsen delivered a perfect game for the first and only time in World Series history in Game 5. The melding of religious devotion and team fanaticism was always one of the hallmarks of fans of the -Beloved Bums.+ It was even rumored that a Catholic priest once delivered a church sermon in 1952 said to have broken the then slump of Gil Hodges, saying -It+s far too hot for a homily. Keep the Commandments and say a prayer for Gil Hodges.+ The Yankees responded in kind. 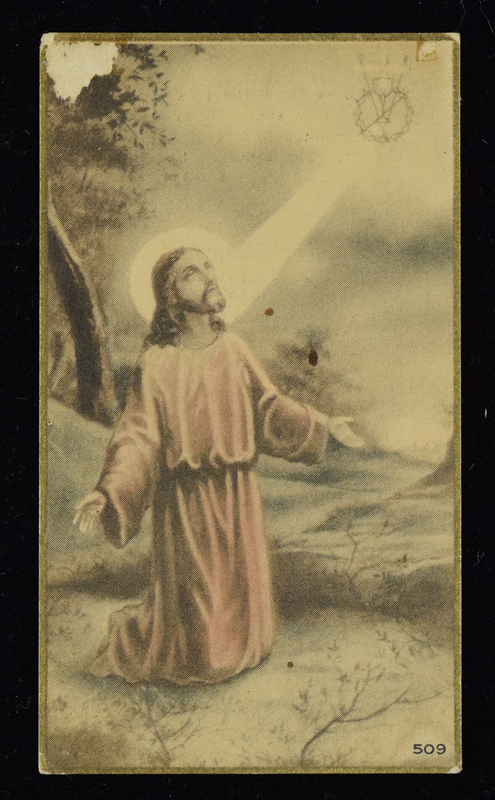 This card provided courtesy of the Yankees pictures Jesus on one side and on the verso is printed with the words offered by St. Ambrose, -We have loved them during life; let us not abandon them, until we have conducted them by our prayers, into the house of the Lord,+ and concludes with a prayer in memory of the Dodgers, ending with -+send Thy angels to conduct them to a place of refreshment, light and peace. Amen.+ This card is the first of its+ kind that we have ever seen and reflects more than anything the camaraderie and competition between these close rivals. This item closed at 09/26/2018 at 10:20 pm. No more bids are being accepted on this item.